From left: Moderator Josh Premako at podium; Edward Headington on microphone; Steven Knight, Star Moffatt and Dr. Lee Rogers. 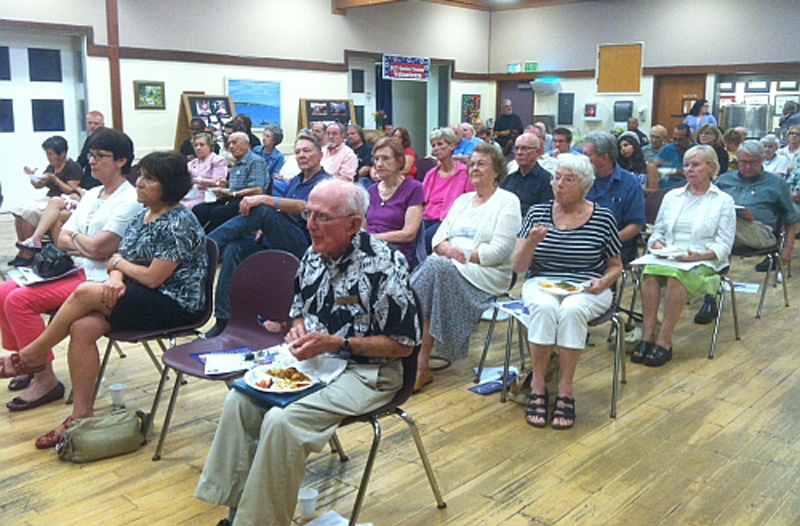 Those stances became a concern for seniors at the Santa Clarita Valley Senior Center in Newhall when they held a candidates forum last Thursday night. If you thought this was about abortion…you’d be wrong. For seniors, it’s about the right to decide how they want to end their lives. 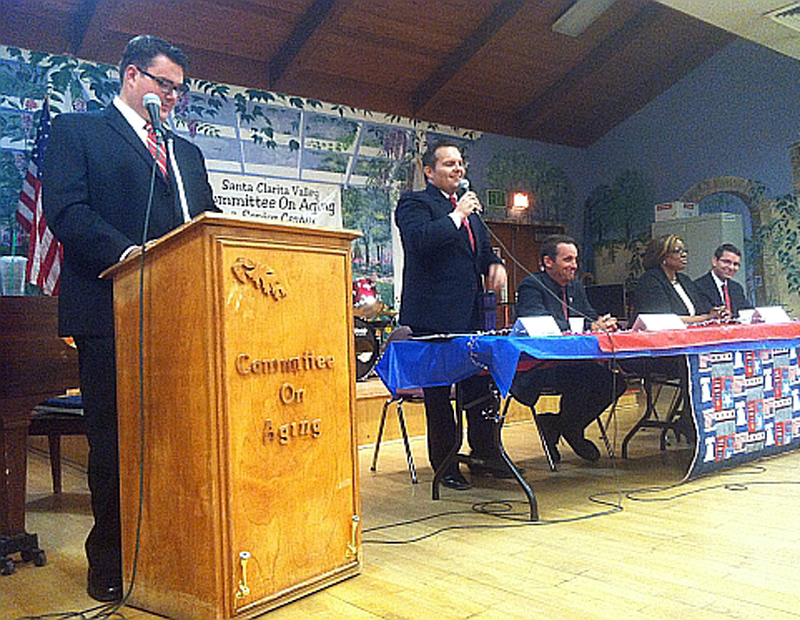 Four candidates showed up at the senior center in a scene reminiscent of a Frank Capra movie. Chairs were set out in neat rows. The floors were wooden and worn like an old basketball court and the walls were hung with paintings by senior artists. Only Jimmy Stewart was missing although the string bean tall Dr. Lee Rogers has a similar physique and would certainly like to be the Mr. Smith who goes to Washington representing the 25th Congressional District as a Democrat. “It’s a difficult question, but I think that it’s ultimately up to the person who is in that situation. It shouldn’t be government that interferes. It should be between the person and doctor. I think if we always default to that then a lot of the problems we have will be solved,” said Rogers. Star Moffatt is a paralegal. The Democrat was studying law when she got pregnant – wait for it…quintuplets. She is running for the 21st California Senate seat which incorporates half of Santa Clarita. “I’m pro-choice. If I’m pro-choice then individuals who want to choose to end their own life that is there own choice,” said Moffatt. Steven Knight, a former officer for the Los Angeles Police Department, is currently the Republican 36th Assemblyman and is now running against Moffet for the 21st Senate District. “Here in California we do have DNRs. We do have Do Not Resuscitate. There are several issues that come about with this: with the families, with the person who is afflicted. But I cannot go down that road. As my opponent says she’s pro-life, I am pro-choice. And for the same reason I think that is a life and I think we should protect that,” said Knight. Edward Headington is the Democratic candidate for the 38th Assembly District to fill the vacancy of Cameron Smyth who has termed out. “I do trust to a woman to make decisions with her body. I also go to church on Sunday and believe that we are endowed by our creator. But ultimately on this issue I think I tend to be a little bit more Libertarian in the sense that people have decision on their life and I think that trumps anything else,” said Headington. “Let’s understand it is a privilege and at some point if you can’t drive, whether your eyesight is gone or whether you just can’t physically do it, that is a privilege. I try to not sugarcoat these answers. And especially with these difficult issues that we get, but it is the truth: we want our streets to be safe,” said Knight. “It’s real important that we take in to consideration people, in terms of their integrity, their dignity and their quality of life…I do agree with Steve that we do have to make sure everyone’s driving safe. We’ll do our best to accommodate people but you’re unsafe to yourself, you’re unsafe to others if you’re not driving according to our standards. “What’s really important is that we make sure that people on the road are safe, both the senior in the car and the people outside of the car. Now that also means that we have to have adequate transportation to be able to get back and forth from the grocery store or from wherever it is that you need to go. So we need to make sure those types of public transportation, senior transportation is well funded so that we keep everybody else safer and we keep the senior in the driver’s seat safe as well,” said Rogers. “As a state legislator I want to look at finding solutions so that we can even reach out into the rural area to those that are homebound. Once we can make sure that individuals have transportation they’ll get their transportation to and from their doctor appointments. And making sure they get to their doctor appointments… that helps with preventive issues,” said Moffatt. Seniors also wanted to know how the candidates would fix Medicare. “It is something that is on my radar. I used to run an institute or leadership class for health care professionals so healthcare is something I am very familiar with… I look forward to collaborating either with Lee or Congressman McKeon on this issue,” said Headington. “My husband and I, we have a law firm. Two areas of practice that we have are tax law and social security law. One of the things we see are individuals that are constantly being denied social security benefits. We see individuals where their Medicare, Medi-Cal is being affected. So one of things…if it was within my purview being at the state level I would introduce legislation that prohibits the federal government for getting involved in state affairs. The state government cannot get involved in the federal affairs of Medicare,” said Moffatt. “For the last couple of years we’ve been looking at what’s been passed at the federal level and what we’re going to do at the state level to implement that. Now some states have decided that they don’t want to implement this and some states have states have decided to put this back further. California has taken a leadership role — whether we’re going in the right direction or not — we’re taking a leadership role. We’ve implemented just about everything we need to for the Affordable Care Act to take implementation. At the state level we’re pretty much done and ready for the implementation,” said Knight. “Medicare is not broken. Medicare is the best insurance company I deal with every single day. Medicare may need a tune-up, but it’s not broken. There are some things that we have problems with. California is the first state to be given a waiver from a automatic enrollment in Medicare. This is going to be a big problem for people in LA County, because LA County is also the experiment for this. Not a lot of people know this yet, but there’s a chance that when you turn 65 in California you’d be put in an HMO instead of Medicare. I don’t support that. I don’t think there should be any state waivers for Medicare. People deserve Medicare when they turn 65 and that’s what I would fight for,” said Rogers.